RARE Complete First Edition set SIGNED by Author. Vol. I: France, pp. vii, 328, illus. ; Vol. II: Belgium, The Netherlands, Germany and Scandinavia, pp. viii, 256, illus. ; Vol. III: Russia and Poland, Italy, Spain, Portugal and Latin America, pp. vii, 216, illus. ; Vol. IV: U.S.A. and Great Britain, pp. viii, 174, illus. 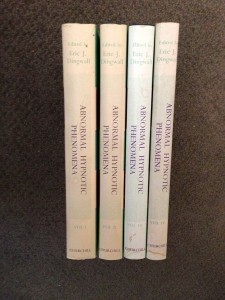 In these four volumes a number of different contributors have made as pecialstudy of the paranormal phenomena which occurred in mesmerised subjects during the nineteenth century. Somnambulism, thought transference, clairvoyance and eyeless sight were constantly in the minds of the early magnetists, who reported their findings in the Zoist and other journals concerned with magnetismorphrenology. A Satanic agency was attributed to Braid, and the hint of the occult in many of the phenomena was suficient both to attract and repel and to make the mesmeric controversy more an emotional than an intellectual exercise. 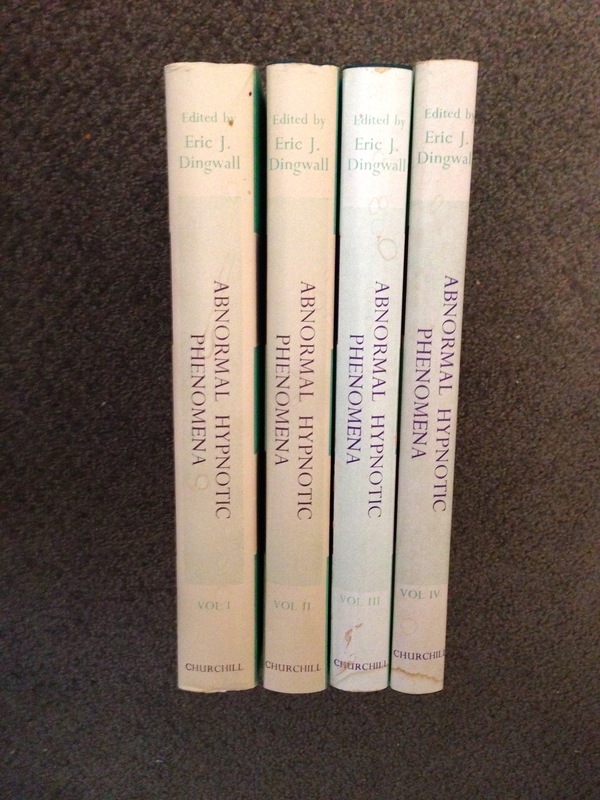 The Parapsychology Foundation of New York has sponsored these four volumes, and has been fortunate in obtaining the editorial services of that remarkably erudite individual, Dr. Dingwall. This entry was posted on November 27, 2013 at 12:08 am and is filed under Uncategorized. You can follow any responses to this entry through the RSS 2.0 feed.